Above the Yukon River, beyond the vast Brooks Range, nearly 80,000 square miles of tundra unrolls a carpet of delicate wildflowers to meet the Arctic coast. The population of the North Slope and Northwest Alaska boroughs, which cover almost all of Arctic Alaska, is about 10,500. Nome and Alaska’s two largest Eskimo communities, Kotzebue and Barrow, are the major settlements in this region, with many smaller villages scattered throughout. This is the traditional territory of the Inupiat people, and Native culture and natural phenomena highlight this region. Inupiat Eskimos still hunt from small boats, residents dry fish on top of their houses and traditional dances and celebrations are held. Ancestors of today’s Inupiat used to collect chunks of oil-soaked tundra and use it as fuel. The Arctic Region is bounded by the Beaufort Sea to the north, the Chukchi Sea to the west, and north from the southern edge of the Brooks Range to the Arctic Ocean. It is crossed by numerous northward-flowing rivers, the largest of which is the Colville. The region has never been subject to glaciation. Much of the land is treeless tundra underlain with permafrost; the Yukon and Kuskokwim Rivers flow through this harsh land on the final leg of their journey to the sea. It consists of the northern slopes and low foothills of the Brooks Range and a large Arctic coastal plain, popularly called the Arctic Slope, North Slope, or simply the Slope. The eastern portion of the plain is narrow, extending only 12 miles from the mountains to the sea at Demarcation Point, marking the boundary with the Yukon Territory, but reaches a width nearly ten times as great at Point Barrow, the northernmost point in the United States. Western Alaska and the Bering Sea coast stretch from the Arctic Circle down to Bristol Bay. This region contains enormous deposits of coal, petroleum, and natural gas. Prudhoe Bay is the largest single source of petroleum in the United States. The area east of the Colville River is encompassed by the Arctic National Wildlife Refuge, the area to the west by the National Petroleum Reserve-Alaska. Small deposits of petroleum and natural gas, as well as huge deposits of coal, are known to be in the National Petroleum Reserve, but the largest petroleum deposits are believed to exist in the Arctic National Wildlife Refuge. High winds are common along the Arctic coast, and average temperatures are too cool to permit trees to grow. Near Nome, summer temperatures can climb into the 60s, but the high 30s and 40s are more common. Winter temperatures, though extreme, are never as low as some Interior temperatures. This is also an extremely dry area, receiving only minimal amounts of moisture every year. Arctic Alaska contains primarily tundra vegetation with tall brush and some forests in stream valleys. Tundra consists of mosses, lichens, and grasses 1 to 2 inches high, sedges and heather up to 8 inches high, and willows taller than an average adult person. 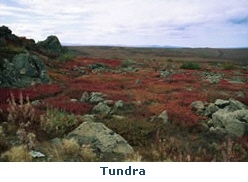 Tundra is characteristic of the northlands around the Arctic Ocean and of other areas in Alaska above the timberline. Huge stretches of spectacularly colorful flowers carpet the tundra in the nightless summer. Plants grow well although the soil thaws less than 1 foot before the long winter returns. Here and there, dwarf willows are found. The boreal forest from Fairbanks to Coldfoot is a cold, dry climate and permanently frozen soils dictate what can grow here. Those tiny, ragged spruce trees may be more than 100 years old! Lightning-caused wildfires benefit wildlife by recycling nutrients into the soil and creating new sources of food and shelter within the old forest. Scan the edge of the forest for moose, fox, wolves and bears. Alaska's Arctic, that is to say the land mass above the Arctic Circle, is split in half by the Brooks Mountain range (The Continental Divide). The Brooks Mountain Range extends across Alaska in an unbroken arc from near the western coast to the eastern border with the Yukon Territory. Averaging 6,000 feet in height, the Brooks is the oldest mountain range in Alaska. Once an active rim of volcanoes, the Brooks is now semi-dormant, with only a few smoking volcano vents. Yet there are many thermal hot springs along both the northern and southern slopes, the larger springs providing water for the rivers even when the winter temperature is sub zero. The scenery in the Brooks Range is most spectacular. It is a complex maze of canyons whose bottoms are usually flat with meandering and/or braided rivers and many lakes and meadows. The divides between the canyons are sometimes sheer rock walls and sometimes mellow, undulating ridges. The only road access into the range is via the Dalton Highway which transects the range on its way from Fairbanks to Prudhoe Bay on the shore of the Arctic Ocean. Only a narrow corridor of the range within hiking distance of the road can be reached via this access. The remaining 95% of the range's area is accessible only by airplane. 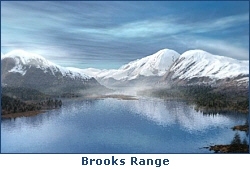 Little has been known about the Brooks Range until recently. The foothills of the Arctic Mountains - the Brooks Range - begin at Coldfoot and ascend to the crest of the continental divide at Atigun Pass. The range extends across the entire width of Alaska and consists of a complexly folded sedimentary mass with a series of longitudinal valleys, chiefly those of the Kobuk and Koyukuk Rivers. Maximum elevations reach only about about 10,000 feet. The area north of the Brooks Range is a region of tundra (arctic) climate and has weeks of continuous darkness in winter and of daylight in summer. Moderated by ocean influences, the winter is somewhat less harsh than in interior Alaska. While the snow cover is thin, strong winds at times create extremely cold wind-chill temperatures. The average annual precipitation is less than less than 8 inches. Golden Eagles soar above this mountainous expanse in search of arctic hare, lemmings or ground squirrels. Specks of white on the mountainsides may be Dall sheep basking in the sun on the rocky slopes. The Noatak National Preserve lies in the western Brooks Mountains and includes Anaktuvuk village and pass. Here there are two branch wings of the Brooks Mountains. The Noatak River forms up from snow melt near Anaktuvuk and flows westward nearly 400 miles to the Chukchi Sea. The Noatak river is classified as a wild and scenic river for its entire length, and is the largest un-touched mountain ringed river in North America. The Brooks Mountains serve as a barrier against winds and the heavy Arctic air to insulate half of Alaska's Arctic territory. Thus the lower half of the Alaskan Arctic is given a less harsh subarctic climate and it has sparse rain and snowfall. This southern half of Alaska's Arctic are the Alaskan steppes which gradually slope to the Kobuk, Koyukuk, Yukon, Chandalar, and Porcupine river valleys. Within this 150 mile north/south band there is a furthest north tree line that exists about halfway down these broad steppes. The scrub growth at the tree line changes to ever-larger growths of dense fir, aspen and birch forests in the river valleys. Descending from Atigun Pass to the North Slope, a transition in landscape begins. The arctic presents itself and stretches to an indefinable horizon. Beyond the protection of a tree line, plants grow close to the ground to survive the brutal arctic winds. Here the caribou, muskoxen and wolverine wander, and snowy owls or gyrfalcons streak across the tundra in search of prey. 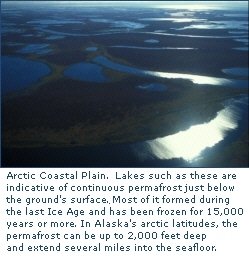 The Arctic Coastal Plain is one of tundra. This region gets very little snow or rain and bio-geographers have termed this type of region a "cold desert." Annual precipitation at Barrow is around 4 inches - far less than annual rainfall of the Mojave Desert. Despite the low rainfall, though, Alaska's tundra is rich in wetlands. This is because of permafrost, which acts as an impermeable layer under the thin tundra soil, trapping moisture close to the surface. The landscape is mostly flat, with a few scattered undulations due to the freezing and thawing of the ground above the permafrost. Most of the hills in this region are therefore, in effect, frost heaves. The flatness of the area results in poor drainage, hence the many thousands of lakes that cover some parts of the region. Additionally, the North Slope is underlain by shallow bedrock, which aids in retaining groundwater. These conditions make arctic tundra a complex mosaic of wet and dry sites. Ice shapes the subtle features of this extreme northern landscape, pushing up pingos and frost boils that become perches for arctic foxes seeking prey. Intense cold cracks the surface, creating polygon-shaped ponds where waterfowl and shorebirds feast on a banquet of bugs (mostly mosquitoes!) each summer. The tundra is a windy place. A contrast in temperature between the land and the ocean creates persistent breezes that sweep across the treeless landscape. These winds can pose challenges for life: wind dries and chills, and can pick up dust, snow, and debris, scouring any exposed plant or animal tissue. The area is all but unpopulated by humans. Herds of caribou roam the area in the summer. Most of the North Slope has short mild summers, except for a few Arctic Coastal areas where the temperature rarely exceeds 40° Fahrenheit. All other seasons are brutally cold throughout the region. The climate in the Arctic Tundra Plains is characterized by storms with high winds and blowing snow, deep cold of -40 to -70°F from November through March, long nights and short days. Winds are common during all seasons and there is heavy snow from fall to spring that buries the earth to depths of six feet or more. From early December to mid January the sun does not appear above the horizon. High noon is dim twilight And, in June through July the sun does not set below the horizon. Midnight in June is twilight. During the summer the snow melts to form thousands of lakes and flowing rivers. The air becomes dense with mosquitoes and black flies making human life untenable except along the coast. The climate in this southern arctic region is rather mild and dry in contrast to the climate along the north slopes and coast. The summers are somewhat longer, beginning in early June and extending through mid September. Daily mid-day temperatures range as high as 90°F from June through July. The Brooks Mountains shield this region from the fall and winter howling blizzards of the North. Winters do bring short periods of low temperatures of -50°F and sometimes -70°F, but there is little wind and the air is crisp and dry. Throughout the winters the temperatures are mostly between -25°F and -35°F. High pressure systems bring in clearing of the skies and arctic cold. Low pressure systems bring clouds and warming. The Arctic National Wildlife Refuge (ANWR) includes nearly 20 million acres, three designated wild rivers, and the largest designated wilderness (eight million acres) in the National Wildlife Refuge system. The refuge contains the greatest wildlife diversity of any protected area in the circumpolar north, including nearly 180 bird species, 45 species of mammals, boreal & arctic tundra plant communities, and 36 species of fish. During the short summers the arctic tundra accommodates the largest herds of wild animals in the world. Called the skin of the earth by the Natives, the tundra is a spongy 1-4 foot thick mat on top of the earth and is a living microcosm of grasses, lichens, tiny flowers, and berries, nourished by the captured snowmelt on top of the permafrost below. Wolves, polar bear and grizzly bear come too, and some of them are resident animals. Other resident wildlife are Arctic hare, lemmings, snow owl, raven, ptarmigan, wolverine, ermine, fox and musk ox, to name a few. Wild sheep and goats reside in the higher elevations of the Brooks Mountains. Caribou migrate there in huge herds to bear their calves, remain during the summer to graze the rich tundra, then migrate south across the passes of the Brooks Mountains to the subarctic rivers and forests in the fall. Great flocks of birds, including waterfowl, shorebirds, and many raptors, including peregrine falcons, migrate to the tundra slopes from as far away Florida and Mexico. Some molt and become land borne, and all hatch their chicks during the summer months, teach them to fly, and then they migrate south in the fall. Nowhere on earth is wildlife more abundant than in the Arctic Tundra Slopes during the summers. The only road access into the Far North is the 216 mile-long Dalton Highway, from Fairbanks to Prudhoe Bay. Carved from the last great wilderness in the United States, the Dalton Highway is a gravel service road that was completed in 1974 to service the Prudhoe Bay oil fields. Access to the rest of the area is via commercial or charter air service. In the winter many people travel by snowmachine and some mush dogs or cross-country ski. Dalton is the only highway in the Alaska system that extends north of the Yukon River and the only U.S. highway to reach the Arctic Circle. During pipeline construction the work camps hummed with big equipment and tough operators. The camps—Happy Valley, Old Man, Prospect, Deadhorse—became new names in the north. The cry of "Gold!" lured fortune seekers up the Koyukuk River at the turn of the century, and they left their names on places like Nolan, Coldfoot and Wiseman. Writers and scientists, such as Robert Marshall and Olaus Murie, ventured into the region and brought its outstanding wilderness values to the attention of the nation. The land holds even older names: Kanuti, Yukon, Atigun and Sukakpak. They echo the heritage of the Inupiat Eskimos, who were the first people to live here. Today these people still depend on the land, its animals and its rivers. As Alaska’s visitors cross the Arctic Circle, many pilots give the plane a slight “bump” letting passengers know they’ve crossed the legendary circle. 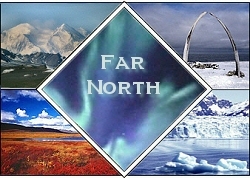 The natural phenomena and native culture make the Far North like no other place on earth. It's a land where legends are passed from generation to generation, yet modern life coexists with wildlife and traditional lifestyles. Arctic Alaska is the land of Northern Lights and the Midnight Sun. Of all naturally occurring heavenly phenomena, few come close to a night with a magnificent northern lights display. Flickering curtains of dancing light against the dark skies - northern lights is certainly one of the most spectacular of nature's phenomena. The aurora borealis or "northern lights" may be seen from late August through April. Ancient Inuit believed that the northern lights were the torches of spirits guiding souls in these shimmering bands of lights to a land of happiness and plenty. Turn of the century gold rush prospectors believed the colors were rising from the Mother Lode. Although the Interior is considered one of the best spots on earth to view the aurora borealis, on clear winter nights especially, one will still the flickering lights dance quite well in this Far North Region.